Muddlin' Through Paseo – Our adventures in our new Paseo "Muddlin' Through"
Two projects last weekend – replaced the control module for the Nova Kool refrigerator, and replaceed the table post with a collapsible gas-strut style. After contacting Nova Kool with our model and serial number information, they quickly and nicely shipped us a new module. We are well out of WGO warranty, and hate to mess with RV repair places anyway, so this was a DIY project. 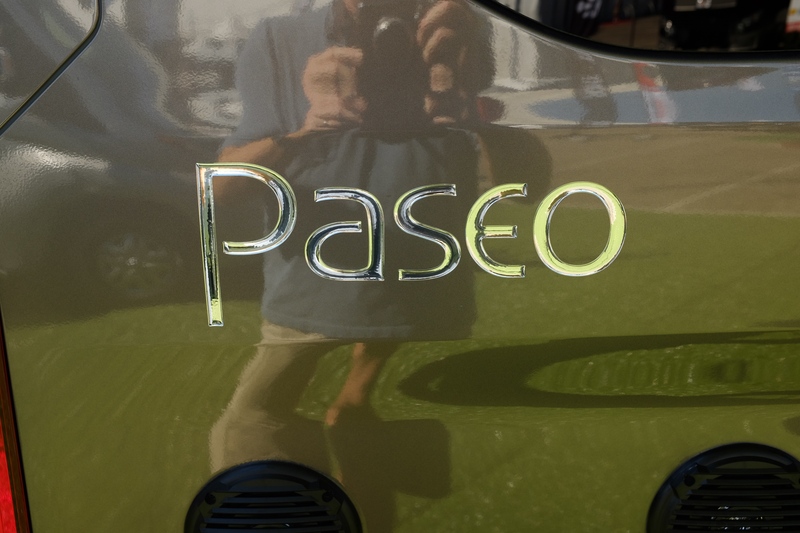 They have some good videos on their website about the module itself, but obviously not much about how to remove it from a Paseo. And you do need to remove it – the module is in the back, and covered by a corrugated more-than-just-cardboard cover that has a ton of screws. One interesting thing – there is a small fan that blows air across the compressor and the coils in the back. Ours was not connected. I decided that improving efficiency was more important that a little bit of fan noise and connected the fan when I replaced the module. You can hear it run, but it’s not objectionable in my opinion. I’d like to know why it wasn’t connected. Lower the noise? A little les power draw? A mistake by WGO? The fan will draw some current, I didn’t look at the model and determine how much. Should be under 500ma. I’m hoping that since the fan should improve efficiency that the shorter run times of the compressor will “pay” for the fan current, but that’s just a gut feeling, I have no data to back that up. One other point I should make – I don’t know that ours had actually failed, although there was at least one incident where fridge temps went higher than they should have. We decided to replace it since it was in the batch that is known to have potential issues. Disconnect the power cable – there is a 2-conductor connector located under the driver’s side bench right next to the fridge. While you are there, use a socket wrench (or socket on a cordless drill/driver) to remove the safety cable. This is a steel cable running out from the back of the fridge and bolted to a Transit structural member in that same area under the bench. Remove the (6?) screws from the front face of the fridge. These are behind cosmetic plastic covering plugs which are a huge pain to remove. Mine got so chewed up in the removal process that I didn’t bother putting them back on, would probably look worse than the uncovered holes! To access the back you need a bit more room, so we moved it up on to the area between the benches. Did not rotate it, there was enough room to work on it sideways. We did remove the table for this project. Remove roughly 800 screws from the corrugated cover (another job for a cordless screwdriver). Now you can access the module. Watch the videos from the NovaKool support pages for actual module replacement. Put everything back pretty much in reverse order of removal. Be sure to get the power cable and the safety cable fed through properly as you slide the fridge back in. And don’t forget to re-attach the safety cable! After plenty of wrestling with the table and the support post as we converted from table to bed to table to bed… well, you know how it goes, we decided to replace it with a air-strut collapsible pedestal. This is a Springfield Air-Powered 3-Stage Pedestal. I believe the part number is 1660230. We paid about $350 for ours. You can find them on Amazon and most boating supply places. the key here is 13″ at lowest point, and 28″ at highest. That matches the original heights. Removed the old post hardware from the table and the floor. Attached the new pedestal to the floor using the same screws. I re-used the hole closest to the hatch, and drilled pilot holes for the other ones – the new base is much bigger that the old one. To attach the top plate to the table, I used the following technique. Screwed the base down using only two screws, and not super tight yet. With the pedestal fully collapsed, place the tabletop in the normal “bed” position. Be sure it is not so far back that the rear door screen can hit it! Laying under the table, use something like a marker to trace an outline of the front and part of the sides of the upper plate. Now you can do the rest without needing to be upside down. Remove the tabletop and unscrew the pedestal from the floor. Turn the tabletop over, and place it on the rails. Turn the pedestal over and place it on the underside of the tabletop (show in a photo below). Line it up with the outline you drew. Drill pilot holes and screw the top plate to the underside of the tabletop. Turn the whole assembly over (the hardest part of this method) and screw the bottom plate to the floor. The rear screen is not interfered with. The table fits between the bed rails. The bed base extension piece still fits. This Christmas found us taking Muddlin’ Through back to the midwest for the holidays. The trip out went really well. Driving was a pleasure, the scenery was great, and we stayed in a couple decent RV parks. One was actually quite nice – the USA RV Park in Gallup New Mexico. Friendly staff and nice level pull-through spots. At one point I noticed the black tank had started reading as “Full”. I doubted that, but was cautious anyway – if there is one thing I never want to experience, it is an overflow of the black tank! Here I should recap. Last year, we picked up our RV at Licthsinn in northern Iowa and spent a week or so running around in some of the surrounding states. Winter to be sure, and the Paseo handled it well. The Truma kept everything nice and warm even when just running on electricity. By the time we realized that we were not going to be able to keep things warm enough, we were already in trouble. Ok, we weren’t, but the Paseo was. Things were starting to freeze. We purchased a lot of RV system antifreeze and attempted to do a partial winterization, but alas once some lines are frozen, that’s no longer an option. And lines were frozen. By judicious application of our hairdryer, we thawed the water tank drain and emptied all of the non-frozen water, which was most of it. We were also able to get antifreeze to at least the galley sink cold-water line, but that’s as far as we got. So at that point all we could do is let things freeze (or in many cases, stay frozen). The interior core temperature never got below about 35 degrees, but at the edges it was as cold as 15 or 20. On electricity it appears that the Truma was able to mainain a 30 to 35 degree differential between ambient and internal air temperature. Plenty if the ambient is, say, 25 degrees. Not enough when the ambient hits zero or a few degrees below. A few days passed, and it was time to head home. Once we had gotten to warmer temperatures, the black tank started reading properly, as expected 1/3. My guess is that some water had sloshed up and frozen on the tank right where the sensors read. Once back in San Diego, it was time to assess the damage. With everything thawed, and the water pump switched back to draw from the tank, we hit the pump switch. The pump ran, and it was obvious that something was leaking since it ran longer than required to pressurize the lines. First leak – the outlet for the outside spray hose at the back of the passenger side bench. Upon removing the connector, the fitting had obvious cracks. Since that is flexible hose, I was able to bend it over and hold it crimped with vice-grips. It still weeped a bit, but was sealed enough to resume testing. Amazingly, that appears to be the only issue! Everything else seems to have either been kept just warm enough, had little enough water, or was flexible enough to come through ok. The fact that Pex tubing has enough flex to not burst when it freezes was undoubtedly a huge factor. The Truma was protected by the fact that the heat was on full time. So between a little emergency winterizing, the Truma running 24/7, and a lot of luck I think we learned a good lesson quite cheaply. Seriously hoping that although further trips may see freezing temperatures for a brief period (e.g. overnight in the desert), that we have done our last foray into days of time in conditions hovering around zero! Filled the pump with RV antifreeze, and as much of the cold water lines as we could. Kept the Truma running (on electricity). Opened up the benches, drawers, and cabinet doors to get as much warmth to the plumbing as possible. Kept the tank heaters on. Opened faucets and bled as much pressure and water from the lines as possible. Did not anticipate just how cold it was going to get, and how long it was going to stay that cold. We should have winterized as much as possible much earlier in our trip. There was probably a point where we had already enjoyed the full use of the RV and could have winterized while it was still warm enough to do so completely before continuing our trip. Forgot to remove the under-sink water filter before running antifreeze through it. Doh! Oh well, we had planned to replace it after this trip anyway, but still a bonehead move. Did not deal with things before we were both fatigued and hurried. That led to things like the water filter mistake. One thing my wife really likes is a fan to keep air moving, both at home as well as in our Paseo. Our first fan attempt was a cheap ~$15 fan that plugged in to a 12V power point. It worked, but was noisy and didn’t really mount well. Also, one speed. So last weekend we got serious. Spent real money for a Caframo Bora 12V Marine 3 Speed Fan. If you are on a nice sailboat and see fans, it’s a decent chance it’s one of these. The spot above the TV was just big enough. Does not block anything of importance, I can still access the cabinet and the Jensen just fine. I was able to run the wiring down and into the hole used to route the TV wiring out of the cabinetry. From there it was an easy run to the 12V fuse panel. One thing to note – if you decide you want heftier screws than the ones it comes with, you might run into the problem I found. If the screw is slightly too long and you place the mounting point as close to the corner as I did, the screw will hit the metal framing inside the cabinetry and not just protrude a bit inside. I think you could go a little longer than the ones that come with the fan, but keep that in mind. I’ll update this post if the screws it comes with prove inadequate over time. So now we have a nice multi-speed permanent fan for the table and bed. Been a rough trip for us failure-wise! The glass door falling out issue finally bit us. The outer pane came out of the track. Inner pane stayed put. All the fasteners are still in place, and the glass looks to be firmly held when in the forward closed position. More gap aft, so when it vibrated open as we travelled, it apparently had enough clearance to fall out. Need to brace the lower track up just a bit to prevent this from happening again. Hoping I still have my pop rivet tool somewhere, and time to visit the hardware store to but some rivets. And last but certainly least, both entertainment system remotes fell off their velcro mounting points on the wall. Guess it got hot enough for the adhesive to fail on the remote part of the strips. Now we have two remotes with sticky patches on their backs. Oh well, have decided that is the perfect location to mount small fan anyway! Ordered the new door for the dump hose storage tube from dwincorp.com. Arrived quickly, and was easy to install. So no more need for the zip-ties! Our One-Place display that had decided we had 4 waste water tanks is now fixed. Did a reset by holding all three lower buttons down for a few seconds until it went into what appears to be a setup mode. One option was “reset”, so with some small trepidation I made that choice. Now back to thinking we have 2 tanks. One feature that is a fair amount of effort to set up and take down is the folding privacy panels that get placed in the cab on the inside of the windshield and the side windows. They do a nice job of adding privacy and a bit of thermal insulation, but the installation and removal makes them less than ideal, especially for a brief stay. And we have to unstick our TPM from the windshield. We are pretty happy with the small curtain rod. (38.5″) We still need to get actual curtains, so in the interim we have used a couple of the beach towels we carry. They have worked great! While this does not give us privacy for the cab, it works great for the rest of the RV. If one of us was using the passenger seat swiveled for the small desk, they would have to be removed, but in that could be done temporarily quite easily. One thing I’m noticing that concerns me is the rise in the temperature of our refrigerator and freezer when it is hot and sunny and the inside of the RV is hot also due to us being absent and the rig closed up. On a sunny 84 degree day we were gone for the morning and most of the afternoon. When we got back the inside temperature was 97 degrees. We did have the rear windows open and the Maxx-Fan at 30%. Maybe that needs to be a little higher? The fridge is normally about 35 degrees and the freezer around 5. However, after heat-soaking all day the fridge was 47 degrees and the freezer was 14 degrees. I’m ok with that freezer temperature, but the fridge was 10 degrees higher than I’d like it to ever be. One thing I noticed was that since WGO keeps the stock windows, there is a window behind the cabinetry the fridge/freezer is in. Between the window and the cabinet back is a few inches of open space. This acts as a nice little greenhouse on sunny days. I wish WGO had filled that space with insulation. It’s pretty hard to access now, but I’m pondering filling it with something. Today we decided to visit our beachfront cottage. As in, we parked our Paseo on the coast road hard up against the beach! It was still cloudy due to the marine layer, so the first things we did were RV projects. Before we actually left for the beach, I installed the now-modified ladder bracket. Dremel to the rescue! With the slightly longer slot, that was the 5 minute job it should have been in the first place. And now with the right screws, the cushions magnets went fairly smoothly. Did discover that for 3 of the 4 holes, I was hitting steel instead of wood. So that made it a slightly larger challenge, but not too bad. Just a surprise. So, jobs from the previous day finally done. I had picked up some foam weatherstripping to address a few issues. Added some foam tape (stacked up) at passenger side window where the factory insulation left a gap. This is just the stuff between the window with the screen and the one aft of it. Found a couple spots around the screen door structure that would let bugs in, so addressed those as well. One rear door panel was loose, so removing an appearance cap and tightening the loose screw solved that rattle. Also added some foam tape to keep the long horizontal expanse that lacks screws from rattling as well. I hope. Taped down the non-skid matting under the benches, and added a little more. Jobs done, we relaxed and began to just enjoy chilling out on the beach! After getting all our feet (8 of them! Well, 50% feet and 50% paws) wet and sandy, we discovered a couple things. One is that the running boards make a good place to put wet shoes to dry. The second and more significant is the usefulness of the water outlet and sprayer inside the rear doors. That did a great job of cleaning up the dog’s paws as well as our feet. Nice work Winnebago! Today we visited Muddlin’ Through to fix a few things. Item one was our rusting ladder bracket. This bracket looked to be defective from the factory. When we picked up our Paseo Linda noticed some rust on it. We mentioned it to the Lichtsinn folks, but never had any follow up. I contacted them a while back about that and a few other missing/defective parts and the replacement bracket arrived several weeks back. So, off with the old one, which was incredibly rusty in many places. Removing this we discovered a bit of hopefully inconsequential damage to the rear door where the bracket tabs (with no rubber padding by the way) had removed some material from the inside door lip. Then the unpleasant discovery that to make the bracket fit, the screw hole had been drilled out a bit. That hole is already slotted, but not enough for where the captive nut was installed on the door. So that job had to wait until I could modify the new bracket. On to the second job – installing the magnets that help keep the side cushions in place. Apparently the very first batch didn’t have these installed. Our cushions have the tabs with their magnets, but their mates are missing from the wall. The screws I had bought were too long (I overestimated the thickness of both the magnets and the wall). So there was the second job also unable to be completed. We slunk home in defeat. Oh, we also noticed that our One Place display had decided we have 4 waste tanks instead of two.